Authorities identified the suspect only as a 24-year-old white man. Austin Police Chief Brian Manley. THE SUSPECT IN a series of bombing attacks that terrorised Austin over the past few weeks blew himself up earlier today as law enforcement closed in on him. Despite this death, authorities warned of concern that more explosives might still be out there. Austin has been targeted by four package bombings since 2 March that killed two people and seriously wounded four others. A fifth parcel bomb detonated at a FedEx distribution centre near San Antonio early on Tuesday. Authorities have warned of the possibility that more bombs had yet to be found. Fred Milanowski, an agent with the US Bureau of Alcohol, Tobacco, Firearms and Explosives, said it was “hard to say” if the bombing suspect had acted alone. What we do know is we believe the same person built each one of these devices. We are not 100% convinced there’s not other devices out there. Mayor Steve Adler thanked law enforcement for their work in bringing down the suspect and urged residents to continue to report anything that appeared suspicious or out-of-place. Isaac Figueroa, 26, said he and his brother heard sirens and helicopters in the area and drove toward them, then cut through nearby woods on foot after they hit a police roadblock. On Tuesday, a bomb inside a package exploded at around 1 am as it passed along a conveyor belt at a FedEx shipping centre in Schertz, northeast of San Antonio and about 95 km southwest of Austin. One worker reported ringing in her ears and was treated at the scene. 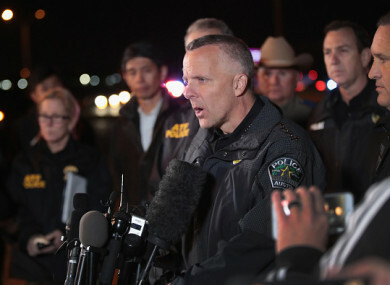 The Schertz blast came two days after a bombing wounded two men Sunday night in a quiet Austin neighborhood about 5 km from the FedEx store. It was triggered by a nearly invisible tripwire, suggesting a “higher level of sophistication” than agents saw in three package bombs previously left on doorsteps, Milanowski said. Law enforcement had a scare yesterday night at a Goodwill store in southern Austin, where someone had dropped off a device sometimes used in military training and it went off, injuring a worker. Authorities don’t believe it was the work of the bomber or a copycat. They said such military items are occasionally donated to Goodwill instead of being properly disposed of. Email “Texas parcel bombings suspect blows himself up as police Swat team closes in”. Feedback on “Texas parcel bombings suspect blows himself up as police Swat team closes in”.